Need to concentrate on a research project? Hunter Library now offers individual, short-term study rooms to students and faculty. Rooms may be reserved online up to two weeks in advance to meet private study space needs. Use the Location menu to review available rooms by library user group. 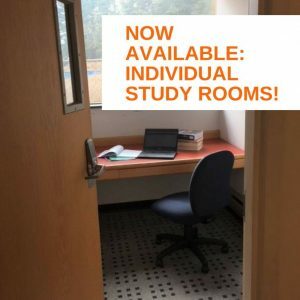 The library continues to offer 14 group study rooms for reserve, include a study room for Honors and graduate students. Patrons may also reserve a virtual reality (VR) station, a service of the library’s new Scholar Studio. VR headsets and equipment may be checked out at the circulation desk with your Cat Card or digital library card available via the Hunter Library app for iOS or Android devices.